It was Adult Family Care (AFC) Awareness Day at the MA State House on April 4! 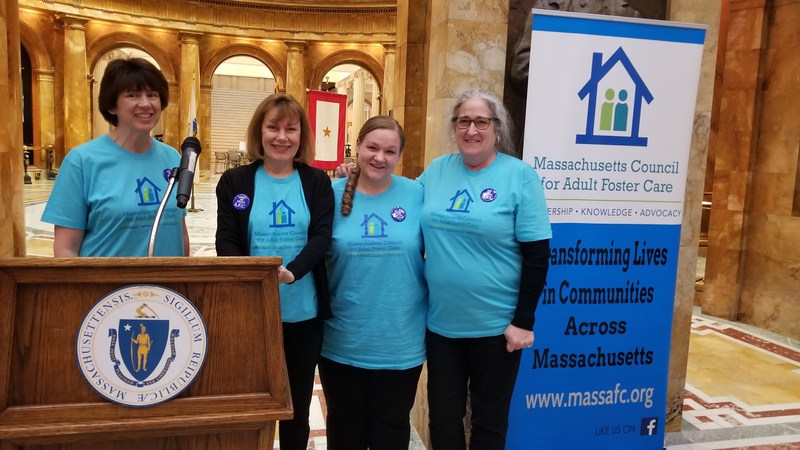 Opportunities for Inclusion's AFC Team joined other AFC providers, families, and friends at the State House to educate legislators and their staff about the importance of Adult Family Care to individuals and families throughout the Massachusetts. Supporters gathered to share information and stories to spread awareness and to advocate for sufficient funding for the Adult Family Care program. Opportunities for Inclusion's Adult Family Care (AFC) Team gathered with other providers at the MA State House. Left to right, Joann Corbelle, RN, AFC Nurse; Barbara Dunker, BSN, RN, AFC Program Director; Camille Grimes, AFC Care Provider; and Kathy Augustini, RN, AFC Nurse. For more information about our AFC Program, please contact Barbara Dunker, RN, AFC Program Director, at 781-899-1344 x4710 or bdunker@oppsforinclusion.org or visit OppsforInclusion.org/AFC.